The Barnstormers were victorious for the second time at home this season after defeating the Utah Blaze 68-32. The first quarter was a game of back and forth between the Barnstormers and the Blaze each scoring after one another. The Barnstormers had the last say in the first quarter along with a missed extra point by the Blaze the score was 21-13. In the second quarter the Barnstormers hit the Blaze hard scoring four times during the quarter. An interception by Khalil Carter midway through the quarter got the momentum swinging in the right direction for the Barnstormers allowing them to score on their next three consecutive possessions and leaving the Blaze scoreless. The Barnstormers went into halftime with a dominate lead after a 10 yard touchdown pass to Jesse Schmidt in the final seconds of the half with a score of 49-26. Both teams were quieted in the second half, but the Blaze were muted scoring only once in the second half. The Barnstormers were already short two of their regular receivers with McCown and Ellingworth both out for the night with injuries, when they put in Larry Kendrick to fill in, but when Blythe was sidelined for the remainder of the game it was Quarterback Brian Villanueva who came in to take his spot at wide receiver. On his first play at receiver, Villanueva caught a 16 yard touchdown pass, to make the score 55-33. Derrick Byrd took away the Blaze’s last possession of the game catching an interception in the final seconds of the game, bringing the final score of the game 68-32. 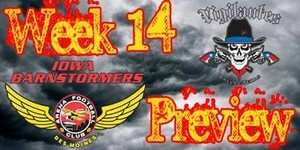 The Barnstormers are road warriors once again as they travel to Dallas for this week’s game. This will be a first time meeting for both franchises. The Vigilantes have struggled all year and are currently on a nine game losing streak; their only victory coming in Week Three against the Oklahoma City Yard Dawgz. The Vigilantes fired their head coach after Game Six, but are still struggling this season The Vigilantes faced up against the Oklahoma City Yard Dawgz last week, but were unable to come out with a victory losing 31-35. Iowa Barnstormers @ Dallas Vigilantes will be broadcast LIVE on 1700 AM The Champ, and on the Internet at www.theiowabarnstormers.com and at www.nifty-tv.com. -This is the first meeting between the Dallas Vigilantes and the Iowa Barnstormers. -Leading Tackler: Jason Harmon (#26) - 11 GP, 73 tackles (58 solo, 15 assisted), 1 interception, 2 pass breakups. Ryan Vena-QB-#7 Week 13 Line: 20 for 22, 245 yds, 7 TDs with a QB Rating of 152.7 and 3 carries for 38 yds and 1 TD. Ryan Vena had a near perfect last week against the Utah Blaze completing 20 of 22 passes for seven touchdowns. This game was one of Vena’s strongest showings at Quarterback so far this season. Vena also had a 34 yard run that was just shy of the end zone, but he was able to carry it the rest of the way in on the next play. This was the second game of the season for Vena with zero turnovers. So far this year Vena has completed 209 of 337 passes for 2613 yards and 53 touchdowns. Vena has also show to be very strong at running the ball making him very versatile with his 60 carries for 235 yards and 17 touchdowns on the season.